Guidances issued between April and July 2016 by FDA, UK’s Medicines and Healthcare Products Regulatory Agency (MHRA), and the World Health Organization (WHO) are providing a stronger foundation for the industry/regulator dialogue around the world on where the current gaps are in industry’s oversight of data integrity (DI) and how those gaps should be filled. The focus has been intensifying at industry/regulator forums on how to evolve knowledge management programs, on the one hand, and the quality regulatory paradigm, on the other, to better support the goal of continuous improvement across the product lifecycle. In this Update, IPQ explores the complexities and challenges in both the downstream and upstream dimensions of the pharma supply chain. Downstream the IPQ focus continues on the ongoing FDA/industry efforts to implement a comprehensive track & trace system for RX drugs in the US: ● the first story, from the vantage point of FDA and pharma manufacturers ● and the second from that of the wholesalers and distributors. 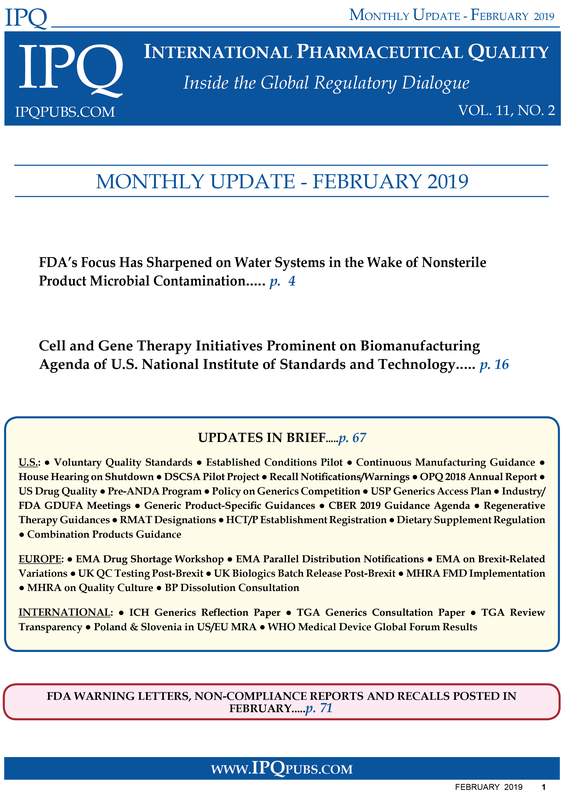 The issue then moves upstream to focus on: ● the divergent ways in which excipients are regulated by agencies around the world ● and how the biotech industry is cooperating to better control the raw materials needed to process and formulate its products. An analysis of the way excipients are handled by regulators around the world reveals significant differences in the registration/licensing and GMP requirements as well as both the form and content of what needs to be submitted to support drug applications. The biopharmaceutical industry is working collaboratively to expand its ability to control the quality of the wide variety of raw materials that are being used in production and formulation through improved communications across the increasingly complex supply chains involved. Wholesale distributors and third party logistics (3PLs) providers are continuing to affirm their desire to take on more stringent licensing and pedigree requirements in exchange for clarity and uniformity of the expectations across the U.S. The complexity of the web of issues that need to be worked through to arrive at a fully interoperable track and trace system in the U.S. for prescription pharmaceuticals by 2023 as mandated by the Drug Supply Chain Security Act (DSCSA) was in full display at an FDA pilot planning workshop in early April. IPQ continues its in-depth exploration of the changes FDA is making to its quality regulatory structure, processes and expectations – their impact and global significance. Focal points include: ● a progress report on OPQ’s first year ● the manufacturing innovation taking place in the more nourishing regulatory environment ● other key issues on the current OPQ agenda ● CDER’s new risk-based API review process, and ● reviewer concerns with biotech product excipients. Also covered on the international front are EDQM’s efforts to drive API regulatory harmonization. FDA’s Office of Pharmaceutical Quality (OPQ) is asking biotech product sponsors to fully explain the process used to select excipients and to provide a risk assessment on potential interactions between the excipients and their proteins.